This old mitre box is a Miller Falls iron and steel miter box. It is in rarely used condition. The blade still has the full emblom from Henry Disston and son's. The saw blade is 26". from tip of blade to the end of the handle is 33". I still use it once in awhile. I just put it on craigslist because of the economy. mitre box with a 26 i. no-name backsaw ? If so, I'd like to get $40. 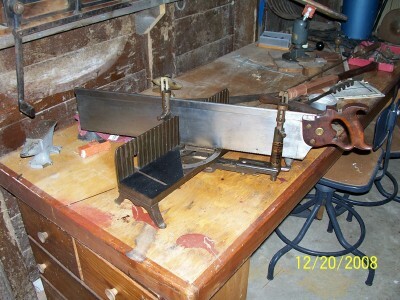 Joe D.
Hi everyone if you love these saws as much as me just give me a call if you are interested in buying one. I have pictures I can send. Call 770-335-3427 Jamie. I also have a Miller Falls 1895 Langdon Mitre Box with a 26" Henry Disstin Saw wotj Langdon Acme Co. printed on the saw. I acquired from a working wood shop. It has been out of use for a while. It is in really good shape with all of the parts intact. I don't really know what they're going for but I intend on selling mine. If anyone is interested, please contact me at TwoLane2@msn.com. I'll be glad to send pics to any interested party. Thanks. I too have a miller falls mitre saw number 69. it is complete and works good but has had lots of use. The last patent listed is 1909. I would like to know what it is worth. I also have a Miller Falls Langdon Acme Miter Box. Mine is Number 71 and I too was wondering what it might be worth. It is missing only one adjustable post and still works fine but has seen a lots of use. I have a saw just like this one. Hi, please let me know if you are interested to sell it. Is the mitre Box still for sale? Is your mitre box still for sale. Mine is missing a rear saw guide.